Keeping your car clean and dirt free is one thing, but making sure that bothersome odors don’t reappear is an entirely different challenge. The pros here at Mr. Clean Car Wash know and understand the challenges you may face with keeping stubborn smells at bay. While we hope you’ll take advantage of our professional interior detailing and savings to eliminate tough odors, but here are a few air freshener types that you can use in between deep cleanings. You can place the canister under your seat or in another compartment for an intricate burst of freshness every time you cruise down the road. Gel packs are safe and not overbearing like other plug-in air fresheners are. And once you remove the canister, the smell is gone and doesn’t linger like a spray would. This freshener is a good product that allows you to conceal it while the scent outlasts all other car fragrance products. Car fragrance sprays are a popular and easy choice for most people because they give off an instant scent. They come in a huge variety of scents to choose from and many are strong enough to last several hours and even days. Many have strong citrus tones. While this spray doesn’t neutralize odors like some sprays do, there is a robust citrus scent that embodies fresh, clean fruit. Air fresheners that plug into your battery charger or clip are another variety that car lovers adore. They are easy to use and provide a burst of scent, especially when your car is running. Some can be overwhelming at first, especially for passengers who are placed directly in line with the freshener. Fresheners that hang in your vehicle either on available clips or your front mirror offer a light scent that can help ward off pesky odors. They are very economical and easy to use and dispose of. 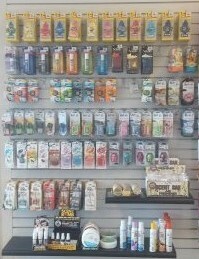 There are several popular hanging air fresheners and is often sold 3 or more to a pack. While an affordable alternative, they are not long lasting like an odor eliminator. Using vent clips offer a quick and easy way to get the scent you love fill the air every time you turn your air vents on. They work great with your air conditioner and the heater in your car. They are a great product that lets you enjoy the warm and cozy scents of home right inside the comfort of your vehicle. The downfall is that they dry out easily and have a short life of just a few weeks, or less if you use your vents very regularly. While portable air fresheners are a great way to keep your car’s air smelling fresh, an odor eliminator by Mr. Clean Car Wash is the best option for lasting refreshing smelling interiors. Contact us today!